Quantum of Solace left a bitter taste in many mouths, both casual and die-hard James Bond fans alike; the suave, storied spy had given into vengeance following the death of someone close to him, flinging him between exotic locations in a jerkily-edited blur of rage. Marc Forster's film felt organic in how it allowed a man like Bond to reach that mind-frame, sure, where his emotions cloud his judgment and detach him from personal connection, but this red-eyed loose cannon neglected to latch onto the stuff that distinguishes the character. When early details of the next film began to emerge, that perception didn't improve right away: Bond would swig beer instead of a martini, one of several product placement initiatives in the wake of stalled production, while certain returning characters would be spruced up for a modern era under the helm of American Beauty director Sam Mendes. Therefore, it comes as a bit of a surprise that Skyfall's brisk momentum and inventive composition not only render a dazzling entry into the franchise, it also deftly lures 007 back into familiar territory. Proof that Mendes has guided the franchise back on track can be found in the opening sequence, an enthralling blitz through Istanbul where Bond -- again played by a weathered, steely Daniel Craig -- and his temp field partner, Eve (Naomie Harris), hunt down a mark carrying a digital registry of undercover MI6 spies. After the chase goes awry, a botched operation under M's (Judi Dench) leadership that puts her under the scrutiny of government chairman Gareth Mallory (Ralph Feinnes), Bond is confronted with the possibility that his skills might be overburdened by his age and ailments, something he's forced to deal with once he learns of a terrorist attack in London. Soon after piecing together that the attack and agent-list theft are connected, 007 gathers his strength and begins the search for the organization's cyber-terrorist leader, Silva (Javier Bardem), in a cloak-and-dagger hunt against the clock that'll take him across Asia and London to preserve the integrity of MI6's operatives hanging in the balance. 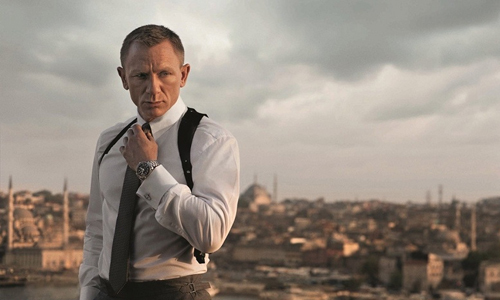 One moment during that early Istanbul chase, a scene featured in the trailers, conveys how Skyfall assures those watching that Bond is back in full form: after a train car dismantles behind him, he coolly adjusts the cuffs of his shirt and presses forward. Mendes understand the character's essence that the audience finds compelling, a world of style, spirits, and tech that the British spy navigates in the shadows; yet, the direction here also enables him to cleanly mold this Bond to the rough-and-tumble spy that Martin Campbell established in Casino Royale. Bottles of Heineken and glasses of hard liquor drown him in his downtime, but that doesn't keep him from the opportunity to order his famous "shaken, not stirred" silver bullet while donning a tuxedo. Guns involving fingerprint recognition add a splash of tech whimsy, while an Asian-inspired, orange-hued den of gambling and seductive women (who's the "Bond girl" here, anyway?) perpetuates that familiar tone. Inch by inch, Mendes works the classics into the modernized Daniel Craig universe. Interestingly, Skyfall works just as well independently as it does as a progression of James Bond's narrative, an intentional choice on Mendes' part. Part of what hampered Forster's entry in the series was how it carried over the events of Casino Royale and focused on personal vengeance, and how losing someone forced the newly-promoted agent into a volatile, melancholy mind-frame. Mendes also incorporates something of a stern pathos to Bond, yet it's not directly dependent on his past actions; he's a weather-beaten, flawed man of espionage who answers the call of duty through several modes of painkiller, whose obligation to country and his "handler" overcome his ailments and nondescript baggage. This is a comfortable arena for the Road to Perdition and Revolutionary Road director, whose shrouded male protagonists often harbor secrets while under transition periods, and his experience shows in a Bond whose skillset conflicts with his years. Driven by a graceful evolution in Daniel Craig's persona, suave, stoic, and prickly at all the right moments, this brand of 007 is in top form here. Mendes' signature method of storytelling, his methodical visual composition, also achieves the distinctive yet careful perspective that Skyfall needed following Quantum of Solace's erratic jostling. Through cinematographer Roger Deakins' lens, the bath of neon lights in Shanghai and the warm glow of a waterlocked casino in Macau lend it an artful edge; the duo incorporate moving, bright-blue digital signs on the sides of buildings as the background of a tense assassination sequence, then focus on free-floating lanterns, Asian architecture, and dragon statues for sheer exotic pleasure. While these flourishes invoke a bit of abstract vision, Mendes never loses focus on the core forward-moving momentum of the action itself, where each set piece -- motorcycles driving on rooftops, firefights in a city's ruins, sprints through underground London -- sustains a steady-handed demeanor. Skyfall keeps things relatively simple, focused on the proximity of people and the danger that looms amongst them, by sophisticatedly conveying the geography and logic of what's happening in fist fights and foot chases. The action in Skyfall is, in a word, riveting, both because of its design and the threat driving it. Focused on anarchy in London that's driven by the plotting of a cyberterrorist, this was the second film of 2012 -- and arguably the more successful one -- that aimed to accomplish the confined terror of a city being dismantled from within, along with the dirty secrets of identity used as a bargaining chip. That tension is driven by Javier Barden's Silva, whose flamboyant manner and ruthlessness craft an intriguing villain specialized in the battleground of digital exploitation, a timely issue when considering the likes of WikiLeaks and transparency. And on top of that, there's a compelling anti-Bond element to Silva that gradually materializes, cycling back to James' tangled outlook. Any misgivings about the script written by Bond veterans Neil Pervis and Robert Wade, as well as The Last Samurai writer John Logan, will likely emerge over the similarities between the suspense beats of Silva's machinations with Christopher Nolan's comic-book franchise, despite more hardnosed execution here. Skyfall's pace affords Mendes the opportunity to realize a pair of clever themes once all is said and done, both of which revolve around the concept of "returning to the basics". There's a line earlier in the film suggesting that even in an age dominated by a digital infrastructure, sometimes there's no escaping the things that must be done in an analog environment -- an idea that comes to fruition in the expanses of a misty Scottish countryside. On top of that, though, we're given a glimpse into the back-history of James Bond that's only been alluded to in text and vague mutterings with Vesper Lynd over wine in a train car, painting a vague portrait of the person who decided to leave his world behind in pursuit of one with little opportunity for identity and attachment. 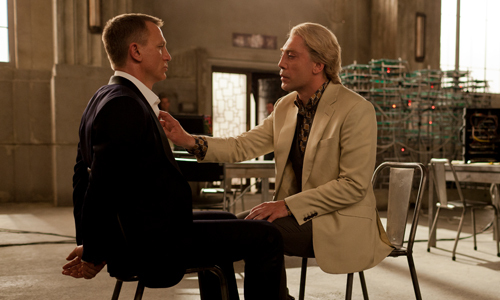 The two intertwine into a conclusion that hinges on classic ingenuity in a tech-based story (with a Peckinpah flair), underscoring the successes of Skyfall in a grand finale that'll convince those watching that the franchise has returned to its roots in a contemporary era, without losing that complex, rough-around-the-edges Bond.